As I've mentioned before, the props for my Christmas Lights to Music shows are all hand made, even down to the light controllers. This year's show featured a 17 foot tall mega-tree as its center stage prop. 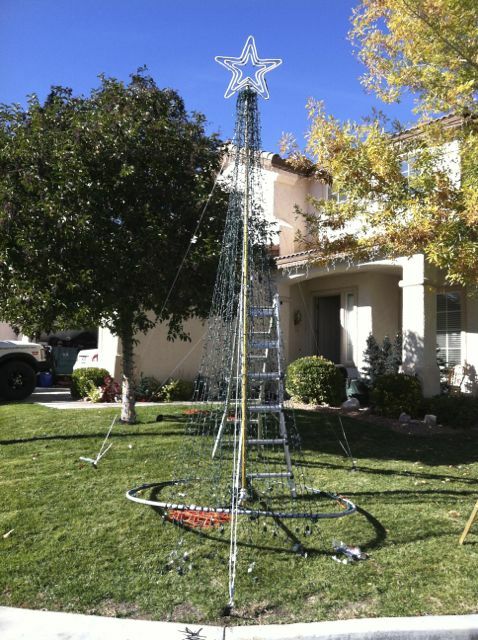 The mega-tree is really nothing more than a guyed antenna mast from which I hang lights from a "hook head" at the top. The lights are arranged in ten panels with each panel consisting of 200 red, 200 green, and 200 clear (white) colored bulbs. Each panel is controlled by three channels in the light controller - a red, green, and white channel. The Light Controller - You can see it near the base of the tree in some of the videos. The Hook Head at the top of the tower mast. It is from these hooks that the light strings are hung. Each light string is 30 feet long and is hung from the hook head at the center of the string, making two 15 foot vertical runs of lights per string. Hanging them from the middle of the string also allows me to have all of the light string plugs and connectors at the base of the tree, avoiding the need to run electrical circuits up to the top of the tree. The exception is the star and strobe lights. More on that in a bit. 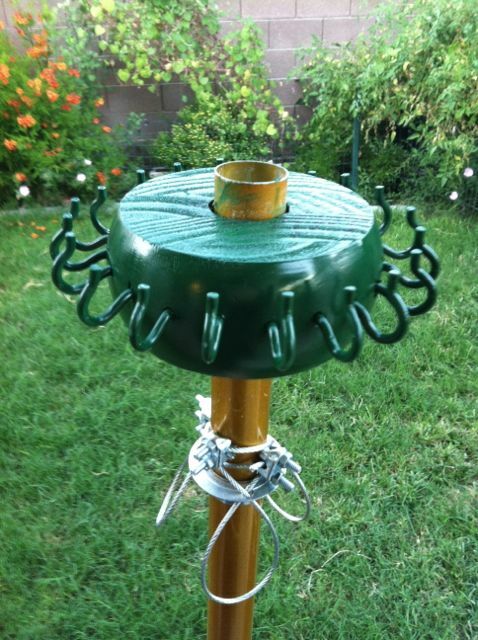 At the base of the tree is the wiring harness which also serves as a ring to attach the light strings to. On the lower ring, each light string is spaced two inches apart. You can see in the photograph of the wiring harness below, black marks where each light string is to attach with a zip-tie. Actually, they're the letters R, G, and W, indicating what color string is to attach at that position. Here, I'm building the wiring harness for the lower ring. Note the green spool of 1000 feet of SPT-2 cable in the lower left of the photo. A lot of wiring goes into the show - several thousand feet of it. Using 1000 foot reels of SPT-2 cable, I make all of my wiring harnesses and cables that run between the lighting controllers and the show's props. Buying the cable and connectors in bulk saves me a lot of money (as compared to buying extension cords) and allows me to make the cables to custom lengths. 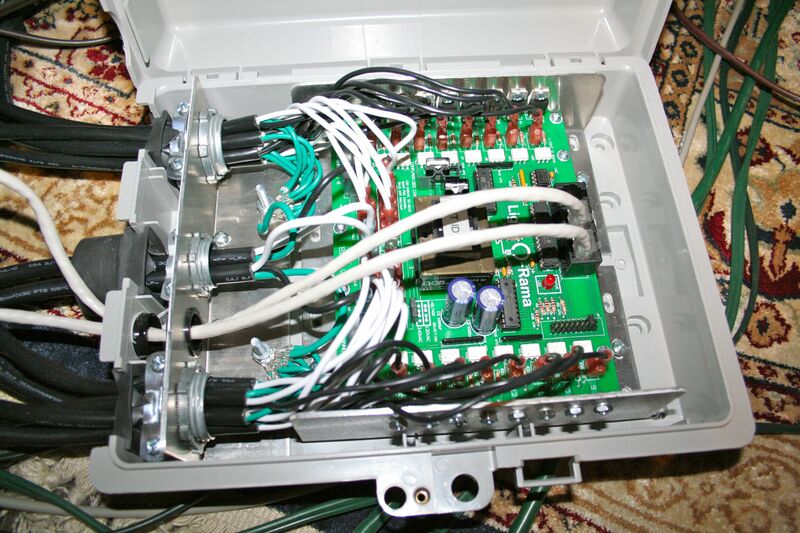 The controllers (seen above in the top photo) are capable of handling 30 amps of lights. To power each controller requires heavy service cords to run between it and the electrical panel in my home. 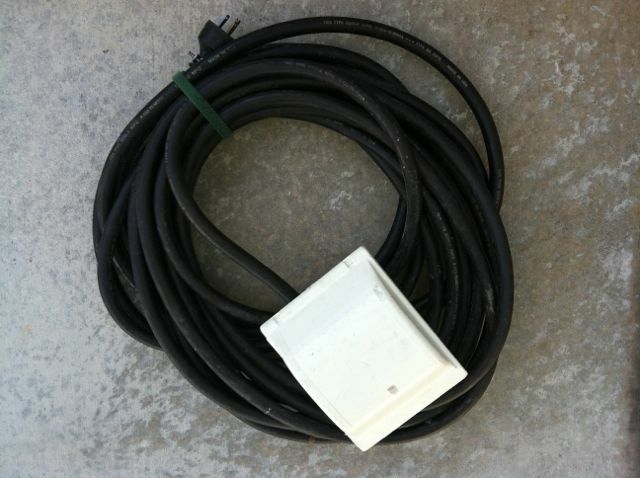 The service cords are almost an inch in diameter and capable of carrying far more current than what is needed. It's a bit of overkill but better to be safe than sorry. Speaking of being safe, each service cord has it own separate ground fault breaker. A ground fault breaker is designed to trip and shut off the electricity if it detects the slightest flow of electricity between the hot circuits and ground. The most likely scenario would be when the lights are wet from rain or snow and someone touches them. The ground fault breaker trips and shuts down the electricity so fast that the person is unlikely to realize they just got saved from a very serious shock. Thus, the entire show is designed with electrical safety in mind. The 2 foot tall star at the top of the tree is made up of three segments, each requiring a lighting channel. 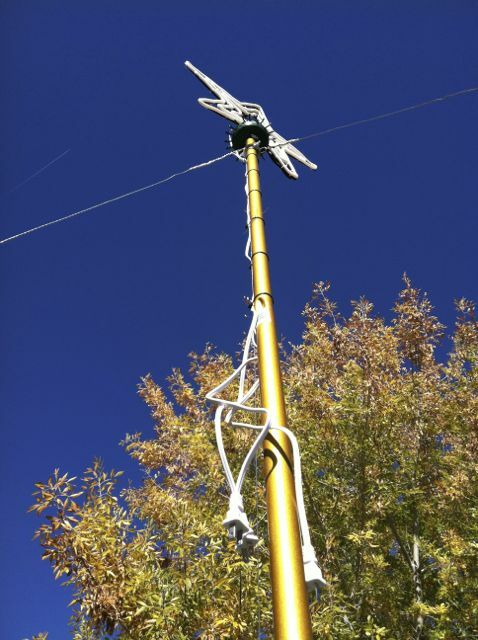 In the photographs below you can see the three lead cords running down the center mast of the tower. Not shown in the photos are the 10 strobe lights that are hung last inside the tree. Also at the base of the tree (not shown) is a small weatherproof speaker and amplifier that plays the music for the show at relatively low volume - just loud enough to hear the music if you standing right in front of the show but not loud enough to bother the neighbors. I also transmit the show's music in stereo on a low power FM transmitter so people can watch the show in the warm comfort of their cars. 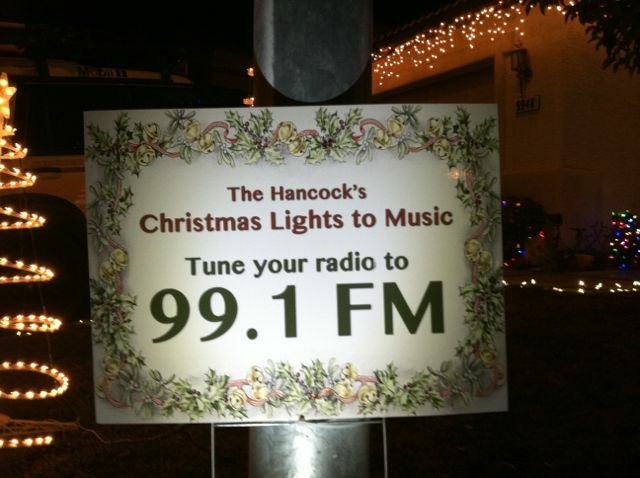 You can pick up the music portion of the show within a half mile of the house. I use a vacant channel so as to not interfere with local stations and visa versa. The rest of the photos are various stages of erecting the mega-tree. Enjoy! 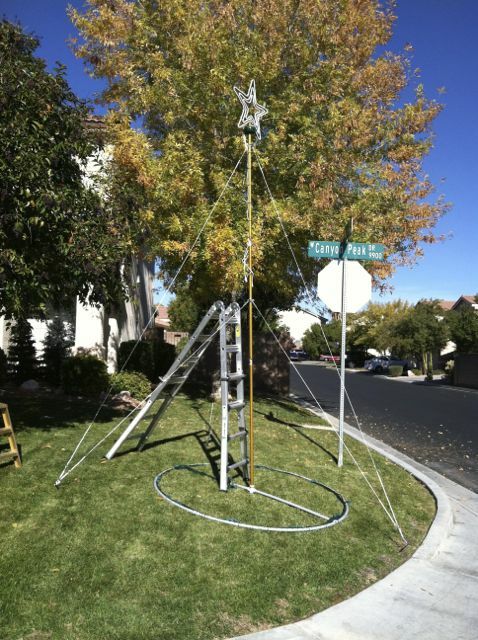 The tree's mast is supported with guy cables at the top and middle. 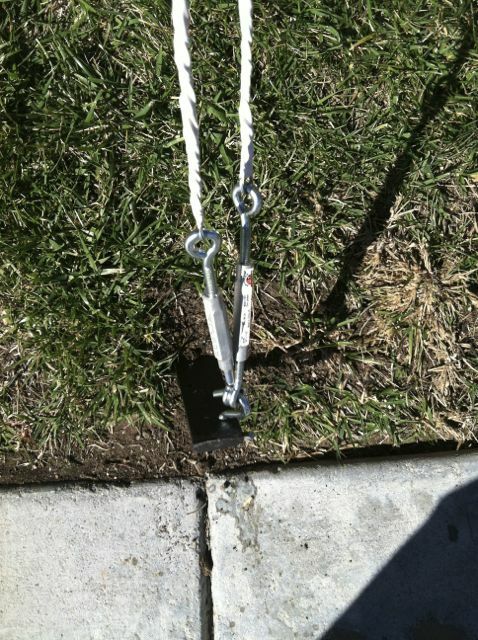 The guy cables are anchored into the ground and their tension adjusted with turnbuckles. This is done so the tree can stand up to high winds. The three lead cords for the star. Each will plug into a channel in the light controller for the tree. Two of ten panels strung. 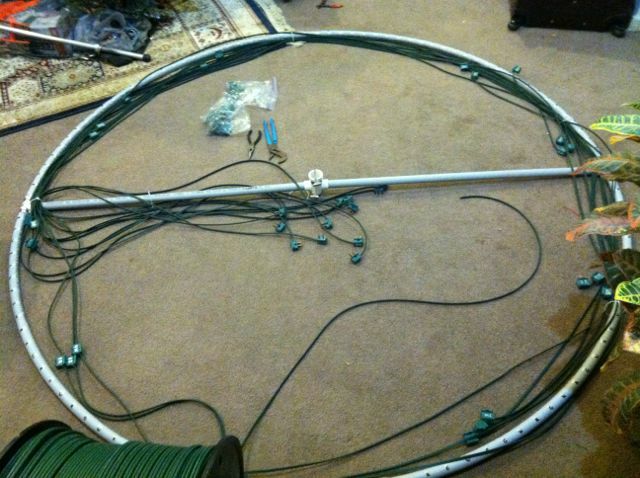 Once all of the lights are strung, the base ring will be held off the ground by the light strings. It takes many trips up and down the ladder to get all 60 light strings hung. This lighted sign faces the road. Tune in your car stereo and enjoy the show.